The AIM NetworkYour SayCan the citizen body (social) litigate a political body (corporate)? Can the citizen body (social) litigate a political body (corporate)? It has to be admitted that the fair state of security anticipated and expected as compensation in what we call “A Civilised Society”, comes at some cost to both the citizen and corporate body. This civilised state is trusted to be implemented by those political representatives elected and remunerated by The Citizens of The State. When we attend daily to our work, business and social activities, we expect to do so with a sense of security and calm deliberation as can be best achieved in the civilised state that has authorities and policing arms to maintain law and order in such a manner as to give that sense of calm deliberation that all is under control and we need not be afraid nor concerned. And, in a civilised state, that is how it should be. Necessity of settlement and all that comes from an established population that is self-reliant and all-inclusive, demands legal boundaries that give clear understanding of the rights and obligations of both corporate and citizen body … These boundaries are the obligations agreed upon by representative members elected to oversee a Parliament that makes such laws and agrees to such social and infrastructure changes as required when needed. It is when these political bodies lapse in their duty of care or deliberately institute legislation detrimental to the citizen(social) body in the majority that it has to be asked if such action calls for the Citizens of The State to instigate legal action against the political (corporate) body to recover and compensate for damages done? What is a legal person or “citizen”? “A legal person (in legal contexts often simply person, less ambiguously legal entity) is any human or non-human entity, in other words, any human being, firm, or government agency that is recognized as having privileges and obligations, such as having the ability to enter into contracts, to sue, and to be sued. The term “legal person” is however ambiguous because it is also used in contradistinction to “natural person”, i.e. as a synonym of terms used to refer only to non-human legal entities. So there are of two kinds of legal entities, human and non-human: natural persons (also called physical persons) and juridical persons(also called juridic, juristic, artificial, legal, or fictitious persons, Latin: persona ficta), which are other entities (such as corporations) that are treated in law as if they were persons.” (Wikipedia: Legal person). So it would appear, to this lay person at least, that there is some scope to name both the citizen (social) body and the political party(corporate) body as “entities” with similar rights and obligations even while they are held apart by a necessity of legal identity. Given then that both citizen and political party can be seen as having identity obligations toward civil law and order, and the breaking of an “agreed contract” between those two parties by either of those two parties, would it then allow a case of litigation to be measured against the offending party? In other words; When we have a political party (say, the LNP) deliberately enacting legislation favourable to a vested interest embedded within that political party but detrimental to the citizen body, would there be scope for a class action by the citizen body to recover damages from that individual political party? “In some common law jurisdictions a distinction is drawn between corporation aggregate (such as a company, which has a number of members) and a corporation sole (which is where a person’s public office is deemed to have a separate personality from them as an individual). Both have separate legal personality. Historically most corporations sole were ecclesiastical in nature (for example, the Archbishop of Canterbury is a corporation sole), but a number of public offices are now formed as corporations sole. The concept of juridical personality is not absolute. “Piercing the corporate veil” refers to looking at the individual natural persons acting as agents involved in a company action or decision; this may result in a legal decision in which the rights or duties of a corporation or public limited company are treated as the rights or liabilities of that corporation’s members or directors. The concept of a juridical person is now central to Western law in both common law and civil law countries, but it is also found in virtually every legal system.” (Wikipedia: Legal person). “Incorporation of political parties Parties are required under the definition of ‘political party’ in s.4 of the Act to be an organisation before they can be eligible for registration …“ (AEC: Party registrations/Incorporation of political parties). Given that most well-established political parties are registered corporations, surely that would place them under the obligations of corporate law? And even though they can claim “mandate” by gain of office to frame and pass legislation, if they promise one set of objectives before gaining office and indeed, used such claims to gain office then do a turn around (as was denied and then done by the Abbott LNP government) and institute political actions and legislation that are destructive to civil institutions and civil infrastructure when in office … surely there is scope to construct a class action by the affected citizen body to recover and claim compensation not from The State (a separate social body from the corporate political body), but from that particular political party? “Sovereign states are legal persons … The concept of legal personhood for organizations of people is at least as old as Ancient Rome: a variety of collegial institutions enjoyed the benefit under Roman law: “Ius Naturale, Ius Gentium”: Law of Persons, Law of Property, Law of Obligations … ” (An Introduction to Roman Law; Barry Nicholas). Hmmm … does the failure of a corporate entity to honour verbal contracts allow natural persons to sue for compensation as liquified damages caused by this failure of the corporate entity to honour the verbal contract. Desperation for solutions to serious problems can lead people to sometimes seek a legal remedy to essentially political problems, and sometimes a political solution to essentially legal problems. There are good reasons to keep political and legal powers separate. Judicial review of administrative action keeps government decision making within legal boundaries. Legislative reform makes law, which is then interpreted and applied by the Courts. The idea of giving ill defined ‘social’ groups the right to use legal process to sue political parties in order to exercise political influence would be a complete disaster. NEC…It certainly has its complexity…but then, if one can litigate for defamatory words on the basis of verbal insults in front of independent witnesses, then surely a citizen body can do the same when a political party makes false and misleading promises in front of witnesses and then proceeds to blatantly defraud the citizen body..? A verbal contract is as binding in law as a contract written and signed. But a contract requires an offer and acceptance and the exchange must include something of value. How much value is there in a politician’s promise? Yes, Crooked Mick…but as we have been seeing for some time now, the judiciary has gone light on the LNP (Tudge/Sukkar/Hunt contempt…the Kathy Jackson case etc) where it could have just applied the letter and to hell with the consequences…so where is the “legal process” when for justice to be done, it has to BE SEEN to be done. ” How much value is there in a politician’s promise?”…point, Rosemary…and I’d like to see a value put on the LNP’s vandalism of public infrastructure at enough to place the entire membership into bankruptcy! The Dutch people successfully sued their government for inadequate targets on emissions reduction but there is debate about if that would work here. “Australia’s rules on standing are much stricter, and originate from common law rules which typically require litigants to prove a direct link to, or interest in, a particular matter. “It’s harder to show a special interest with climate change because it’s a global problem and so [the question is]how do you show that you have some sort of special linkage to this issue that’s above and beyond any other group?” Prof Peel said. After that, litigants would need to make out the argument that the government owes citizens a duty of care to safeguard its people from climate change, and that if that duty of care was breached through inaction it would give rise to material harm to the citizens who are owed the duty of care. “It was one thing, the judges said, to rule on a specific promise made under specific circumstances to a specific person, where the court could predicted the consequences of its decision. And another case in England regarding the government’s promise to have a referendum on whether Britain should ratify the EU constitution. Thanks, Kaye for the clarification of some issues…but with this bit..: ” “. . . and the question whether the government should be held to such a promise is a political rather than a legal matter.”….it is precisely THIS which I ask could such be litigated against when the politics crosses the line and – as you state above in another example – damage to civic infrastructure or public health is put at risk…in the case of the NBN, I would claim a well-proven case exists for just such litigation against the LNP. And again, if we refer to that case of contempt against the three LNP members, applying the above criteria of whether it is a political rather than a legal matter…we have to ask ; Why did it NOT end up in the courts? ..because it was turned into a political matter when quite clearly it was a legal matter. What initially prompted me to propose this thesis was my loss of confidence in the oversight of any judicial authority keeping tabs on this LNP govt’…the outrageous behaviour of many dept’s under their management, going from duty of care and responsibility (in the case of refugees) to outright waste or gratuitous throwing of largesse to network friends to the deliberate refusal to follow court directions (in the case of Brandis’s diaries?) without any care for procedure, means that perhaps we will have to by-pass the judicial oversight and take civil action against the actual LNP. TPPP. Trans Pacific People’s Partnership. I canvassed this last year and what you will find is that the pollies have legislated that their parties can’t be prosecuted. They fall foul of the ACCC and the Trade Practices Act and there’s nothing anyone can do about it. Bob Rafto….This has been a worry for me for some time too…it would seem that particularly the LNP, with its more predominant network of “old school tie” connections among the higher echelons of society and within the MSMedia conglomerations and business circles, is being give a clean run to do a bit of “house-cleaning” in regards to keeping the immigrants and lower-classes in line…These regular pogroms that reassert the power strata of society seem to come around whenever a LNP govt’ gains office..and then..it would appear to be (as far as they are concerned) just in the nick of time…a most curious and advantageous electoral phenomenon!…not at all to be confused with that other curious voting phenomenon ; The postal voting system that ALWAYS seems to favour the LNP….I mean…all those working-class voters from those working-class suburbs away on holidays and forgetting that they can now do a pre-poll vote…but then, being the conscientious voters that they are….trudge down from their Asian holiday destination or the wilds of Wales and Scotland to the nearest embassy outlet and cast their vote…as if! When we see the infiltration of right-wing lobby groups to the most inner sanctums of parliamentary operations, without oversight , fear or retribution…we have to reserves a tad of suspicion that organisation of some kind favours that side of politics…but not wanting to fall into the gaping maw of conspiracy theories, one is inclined to pull back from direct accusation. Though one has to question the recent years of criminal activity by those LNP ministers who having “done their bit” to destabilise the system in favour of either good timekeeping (those Rolex watches?) or good diary attention (Slipper/ Brandis) or just good, plain old corruption of office (the solicitor general affair) end up rewarded for taking one for the team with position and remuneration most suitable to their betrayal of the people and the State. It’s getting really bad when the private citizens of a State have to consider litigation as a last resort to get judicial oversight of the political behaviour of a govt’….I put it all down to the ABSOLUTE failure of the upper middle-class to discipline itself (beyond the usual whips and spurs!!) to maintain law and order among its own strata of society. The creeping stealth of that class of private schooled scum that has formed favourable networks with massive financial reward as its end goal. We hear Sally McManus and the ACTU call for a “change of rules”, and I respond with first we have to change the ruling class…I cannot see a way out of the current dilemma sweeping the entire western world of crazy RWNJ’s guided in their insanity by those same private-schooled jerks and buffoons pushing failed and obsolete social and monetary policy down the throats of gullible voters…other than a complete “wiping of the slate” aka Josef Stalin or Mao….perhaps we need a “cultural revolution” here in Oz!…at least THEY knew how to get the job done. Good question Joseph. I also pondered the same thing and recently asked on another site if anyone knew if it were possible to sue for breach of contract. 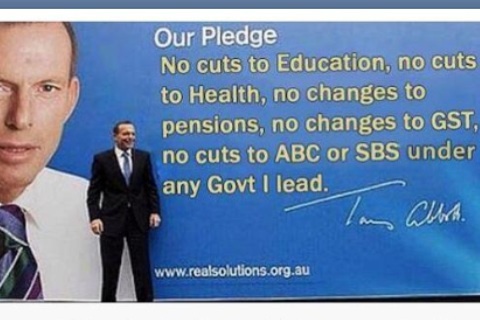 I was thinking about Abbott’s lies about cuts to the ABC . Surely if you promise something in return for being elected, you have made a verbal contract by doing so. Furthermore, how can a self- confessed liar be allowed to even remain in parliament? @RosemaryJ36: Uhm … could the “something of consideration” be the elector’s vote at the election? Certainly that vote would be “something of value” it could be argued because without the vote there would be no benefit to the politician seeking election to political office??? In politics there is no institutional mechanism by which voters can enforce the pledges that their elected representatives have made. Economist Robin Hanson suggested politicians should post personal bonds that would be forfeited if a promise was broken. But that ain’t ever gonna happen. Very interesting article Joseph! In the light of the Banking Royal Commission, I was looking at the possible remedies under the Australian Consumer Law (formerly Trade Practices Act). Misleading or deceptive conduct (often referred to as just misleading conduct) is a doctrine of Australian law. If Banks and Political Parties and their employees, or members, are exempt from the provisions of Australian Consumer Law, then I believe pitchforks will be the only remedy! The Australian Consumer Law (ACL) is based on the proposition that low consumer power or lack of information is a market failure which needs to be addressed by interference in the market. Section 18 of the Australian Consumer Law, which is found in schedule 2 of the Competition and Consumer Act 2010, prohibits conduct by corporations in trade or commerce which is misleading or deceptive or is likely to mislead or deceive. The states and territories of Australia each have Fair Trading Legislation either containing similar provisions in relation to misleading or deceptive conduct by individuals, or simply applies the federal law to the state or territory. Section 12DA of the Australian Securities and Investment Commission Act 2001 prohibits misleading or deceptive conduct in financial services. The doctrine aims primarily to provide consumer protection by preventing businesses from misleading their customers. However, it extends to all situations in the course of trade or commerce. A range of remedies are available in the event of misleading or deceptive conduct. MISLEADING OR DECEPTIVE CONDUCT CARRIED OUT BY COMPANIES CAN ALSO BE PROSECUTED BY THE STATE (under Chapter 4 of the ACL). The inclusion of unconscionable conduct in the Australian Consumer Law is a codification and extension of the equitable principle of ‘unconscionability’ which was later clarified as a cause-of-action. The High Court of Australia held that an act was unconscionable if a party to a transaction is under a ‘special disability’, the other party is or ought be aware of that disability, and that other party acts in a way that makes it unfair or unconscionable to accept the offer of the weaker party. Section 20 codifies the common law by referring to the “unwritten law” (i.e. the common law). However, the inclusion of section 20 allows for remedies under the Law. Section 21 bans unconscionability in consumer transactions. Section 22 gives factors that indicate unconscionability. This clarifies the application of unconscionability and circumstances where a consumer is at a “special disability”. It would be interesting to see a State Government stand up to the Banks and the Political parties and seek relevant remedies? Ain’t gonna change any time in the next millennia or so, even if we managed to elect a majority of politicians with a conscience (politicians with a conscience – haw, haw, haw!). David Bruce…Certainly a consideration that needs addressing..The thing that keeps coming to the fore is that while there is ample evidence of rorting, fraud and egregious behaviour right across the cabinet..there does not seem to be ONE IOTA of responsibility expected or adjudicated upon by an overseeing authority to “keep the bastards honest”…and one has to ask : What point democracy when it is trashed so openly and wantonly by those very politicians that continually proclaim their dying allegiance to it? Where now for the citizen body? And I wanted to point out that these political parties, being registered as a organisation / corporate body ought to be liable to be litigated for their failures. State Governments have introduced controls on political corruption, so it is timely for the next election to be held on the policy for the Federal Government. Misleading or deceptive conduct is a “strict liability” offence, in that it does not matter whether the conduct was intended to mislead or deceive, or even whether the claimant could reasonably have protected its interests. This means that so long as there is an element of reliance on the part of the claimant, a respondent could be found to have engaged in misleading or deceptive conduct even if they had every reason to believe that their representations were true. The reason for strict liability in this instance that a person making a representation is always better placed to know about whether or not it is true than the person relying on the representation, so the law is constructed to shift the onus of ensuring that the representation is true onto the person making it. This is in contrast to the traditional common law principle of “caveat emptor” or “let the buyer beware”. Perhaps. But some would say that’s what elections are for. Unfortunately, at the election restaurant the diners pays in advance and no refunds are available. As for the proposed National Integrity Commission, surely Labor (if serious) could produce a Green Paper with a promise of a White Paper to follow within the first three months of government. You know – develop a wide ranging reform agenda that would excite their supporters and cause great angst among the serial offenders in the government ranks. There’s so many areas ripe for agenda setting. Even big ones like Health and Education. It doesn’t always have to be always about the economy. Matters not…” As for the proposed National Integrity Commission, surely Labor (if serious) could produce a Green Paper with a promise of a White Paper to follow within the first three months of government.”…Now THAT is a good suggestion. There’s any number of options that can be explored by Green Papers (or their equivalent.) The advantage of a Green Paper is that the developer(s) remain uncommitted, although their preferred position can usually be discerned from a close reading of the document. Politicians love political back doors and Green Papers have them in spades. All care taken but no responsibility for simply floating an idea. Green Papers also take up political slack. They take up political space. They demand attention and lower the chance that ‘fake news’ will inhale all the oxygen.